Our award winning assorted selection of cupcakes are now available at Deliveroo. 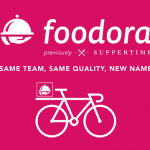 Vanoir is proud to work with foodora, to extend our deliveries across Sydney CBD. Our cupcakes and sweet treats have been hand crafted with passion, love and the greatest care by our amazing team of cake designers. Using creative patisseries skills, high quality ingredients and time honoured techniques, we delight in giving rise to cakes that can be shared with friends, family or savoured solo.